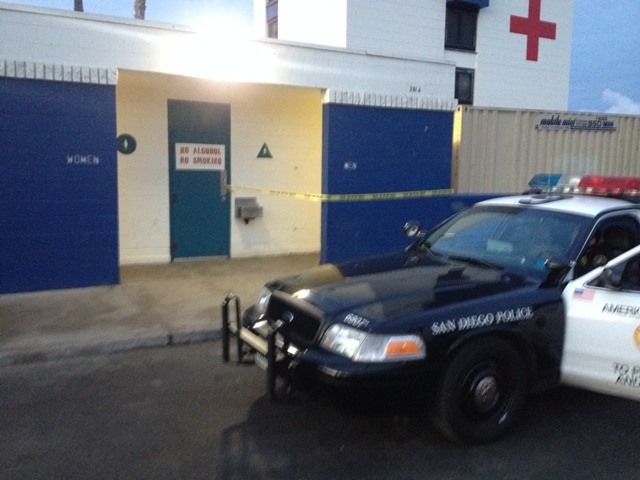 It is reported that a man was found deceased in the public restroom of the main lifeguard station in Ocean Beach on Wednesday, November 20. A witness said he still had a needle in his arm. Yellow police caution tape was up on the restroom. We have no other information, no name, no nothing. And as far as we can tell, it has not been reported in the media. 2 kids pricked by needles in the sand the last few weeks. Seems to be a growing problem in that area……..
I’m really glad this has at least been acknowledged – – by someone, somewhere. I surfed Wed morning and it looked like it does literally every other morning of the week. I, with what I suspect is virtually everyone else down there, had no idea anything was going on (it’s very common to see a cop car in the lot – and it was just 1 cop car). It wasn’t until after I surfed and was pulling out that I looked to my right and saw them rolling a gurney out of the bathroom – – complete with a covered dead body. I stopped in disbelief looking in my rearview to see them roll the gurney to a very non-descript, parked white van. No crowd, no fanfare. I’m not even sure the PLHS surf team kids in the lot even noticed. The whole experience was really disturbing yet incredibly ho-hum. Just another morning in OB… We shrug our shoulders, shake our heads, and move on. OB deserves better. Again, thank you for at least acknowledging this very disturbing incident that occurred in our own backyard. Perhaps they were trying to keep it quiet and not have the kids see a dead body being rolled out of the restroom. You don’t need more than a 1 or 2 officers to handle an O.D. If the guy was murdered that’s another story. I had a friend who died the same way,only in a Burger King bathroom.I don’t think he would have wanted a crowd or fanfare. He would have been sorry to inconvenience everyone and embarrassed for them to know he overdosed. The opiate addicts from the Portland area that “train hop” end up in OB every October and November . I had a discussion with police about this last year after my car was broken into at this time of year. Maybe if the cops would get out of their cars and actually PATROL the streets of OB would be a bit cleaner. I heard about the man that died tonight as we stood in line at Rite-Aid buying batteries for our Subaru keyless entry. Standing in line at Rite-Aid tonight was different than usual; we were standing in the beginnings of a trail of pools of blood. Bright red and starting to curl, the path went around through the line of chips and DVD’s and ended at one of the register counters, whereas the blood was everywhere. There were about 12 of us in the line, trying our best to avoid the blood covered floor when I was told of the dead guy with the needle at the Lifeguard tower.. gross, gross and gross..
One fled the scene and the other fled his thoughts. When did OB become an area of blood, death, disease and dirty needles for children to play with? Game over… I am pissed.. I heard that the young man found deceased in the bathrooms was a local and not homeless. I have heard about 3 different versions of the deceased.. our hearts go out to him and his family..